Chcemy zobaczyć trójkątne domki, które są w samym centrum, przy ratuszu. Ludzi tu pełno i ciężko zrobić jakieś sensowne fotki bez nich (znaczy bez ludzi, nie domków ;) ). Jedyna ich wada to konieczność wymiany słomianego dachu co cztery - pięć lat. A gdyby tak zlecić zrobienie takiego dachu polskiemu strzecharzowi? Może wytrzymałby dłużej? There's a looong tunnel going to Santana. They must have worked so hard to build all those tunnels and levadas! But we wanna see triangular houses - they are in the center, near the town hall. There are so many people and it's hard to make a nice photo without them (I mean without people, not houses ;) ). The houses were first being built in XVth century for the first settlers. They are small, colorful and nice :) I'd like to have such a house for myself :) The only one disadvantage of them is that a straw roof must be replaced every four - five years. Te domki to jedna z wizytówek Madery, pojawiają się na kubkach, miseczkach, a sklepów z pamiątkami też jest tu sporo. Choć na ile są one oryginalne, to ciężko powiedzieć (domki znaczy się, bo wśród pamiątek wiele jest made in china, niestety. ja, wśród tego całego natłoku przedmiotów, znalazłam sobie ręcznie malowaną miseczkę, z domkiem oczywiście ;) ). 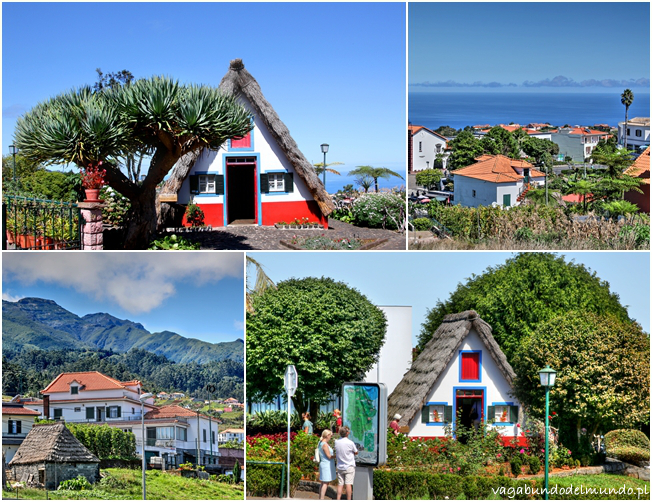 Those houses are one of the highlights of Madeira, they are on cups, bowls - there are many souvenir shops here. Well, it's hard to say if they are original (I mean the houses near the town hall, 'cause many of souvenirs are made in China unfortunatelly. I found a hand made and painted bowl, with a house of course ;) ). Idę kawałek na górę, żeby uciec od tłumu i poszukać trójkątnych domków 'w naturze', bo ponoć też takie tu są. Znalazłam trzy :) Jeden u kogoś w ogródku i ten chyba jest najładniejszy. Drugi przy drodze, a przed domkiem, częściowo zajmując jeden pas drogi, suszą się ziarna kukurydzy :) Trzeci jeszcze wyżej, pusty. I go up a street to run away from crowd and find another tringular houses 'in nature' - they say there are a few. I've found three :) On of them was in someone's garden and this one was the best. The second one by a road with grains of corn drying on one traffic lane. The third one up the hill and this one was empty. It's nice green around. There is a sticker with wifi connection on the main square, but the girls haven't caught it. We sit down in a cafe. The girls found puddings - made of chocolate or marakuja. The second one is delicious, much much better then the one in Sao Vicente. But there is a problem with the price. In the menu it's written that it costs three euro, the lady says it's 3,50. When I show her the menu, she says something about fruit salad. And when I don't want to pretend a stupid one, she says this menu is old one. Many of them lay near the entrance, hahaha.